Welcome to Martha E. Rogers’ Nursing Science: The Science of Unitary Human Beings 2.0 on Pressbooks. The wiki book is a work in progress, which is why some chapters are not yet complete and content is continually evolving and being updated. This site was originally designed as a wiki site in 2.2.08 on a site at Wikispaces. In viewing the statistics on the site, I could see that over the past 10 years, the site averaged more that 100 hits each and everyday. However, wikispaces closed down in 2018 and I needed to find a new home for the wiki. On 6.1.2018, I recreated the site on Pressbooks, managed by the University Iowa. Rogers never wrote a Second Edition of her landmark book An Introduction to the Theoretical Basis of Nursing which was first published in 1970. The text is now out of print as are most all major texts on the Science of Unitary Human Beings. This site is designed to allow participants to collaboratively explicate the Science of Unitary Human Beings (SUHB) and to serve as a resource to all those wanting to learn more about Rogerian Nursing Science. The strength of a wiki is in the ability of every member of the community to contribute, be it with providing content, expanding understanding, raising questions, offering insight, and providing answers. Many wikis are completely open for anyone to edit and have no authorship. A wiki intended as a open forum, for example, might be free-form to allow for emergent structure. However, most wikis whose ultimate aim is to be a source of accurate information have an organizational vision, an “organizer” or primary author. Often this is the person who initiated the wiki, or “organizer.” The primary Editor or “organizer” of this wiki is Howard K. Butcher, RN; PhD, who created this site. Howard is an original member of the Society of Rogerian Scholars, has published over 30 journal articles and book chapters on aspects of Rogerian Science, a former editor of Visions: The Journal of Rogerian Nursing Science, and is the creator of a Rogerian research and practice method. 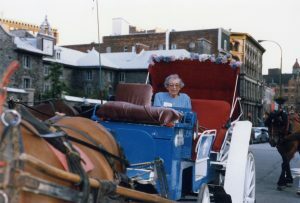 Both Howard’s Masters thesis on guided imagery and time experience and PhD dissertation on the experience of dispiritedness in later life were conceptualized within the Science of Unitary Human Beings. Most wikis whose aim is to be an accurate reference source are “protected.” This means that only those who join the wiki as members are able to edit and add content. Those members who contribute to the content of the wiki will be identified as co-editors. This site can be viewed by anyone who links to it. At this point, there are no co-editors identified because the Editor has written nearly all the current content. Everyone can read all the content on the wiki, so you do not need to be a member to access all the content. To become a member, send an email to: howard-butcher@uiowa.edu requesting to join. The reason to request to join this wiki as a member is to contribute to writing content. Requesting membership means that you wish to edit and add content to the wiki chapters. Therefore, those requesting to join should have an indepth understanding of Rogerian Science in order to contribute to the development of the wiki content. Content is to be written in a scholarly manner much like a textbook using 6th APA style references. Any member of the wiki is free to edit, add to, modify, revise, or delete content with the intent to improve and/or expand the content. Pressbooks provides numerous links on this wiki to help anyone learn more about how to use this site and contribute to its content. I do envision that in addition to the content in the wikitext “The Science of Unitary Human Beings: Theoretical Basis for Nursing 2.0,” this site will have unlimited potential and an emergent design. For example, this site can be a virtual community for Rogerian researchers to post abstracts; educators to upload Rogerian teaching resources; students to share their papers/projects; a place for links to essential references/documents; for all to engage in multiple conversations about issues concerning the SUHB; and most importantly, unlike print text, a resource/reference where the evolution of the SUHB can be continuously updated. This wiki should take the form of a book, with each section (page), as a chapter. There is no limitation to the length of each chapter. Unlike a book, links to other relevant webpages, video, audio, images, or full text references may be embedded in the text of this wikibook. 1) If you use content in this wiki in assignments or manuscripts, you must attribute the work in the manner specified. 2) Content form this site can be printed. For any distribution, you must make clear to others the authorship of this work. The way to do this is with a link to the web page. 3) This site is noncommercial, meaning that the content created on this wiki site is not to be sold. Rather, access to the content developed on this site is to remain free to any user. 1. This document wiki is meant to be scholastic in nature. This means that you should try to avoid writing simple opinions – back up writing with sources and information. As well entries should be spelling and grammar checked. 2. Delete and edit other entries with care. Only edit other people’s entries if you have something constructive to add. 4. Wiki presentations are collaboratively authored – which means they don’t have bylines. I have be fortunate to have been mentored by Dr. Rogers, both as a Masters student at the University of Toronto and as a PhD student at the University of South Carolina. 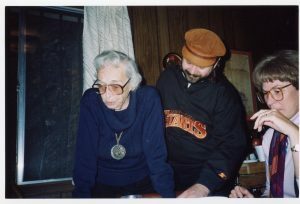 Over those years, I treasure the times I was able to spend with Dr. Rogers, and thought I should share some of those photos. Nags Head, NC where I took a two week course in Rogerian Science as part of my PhD studies. 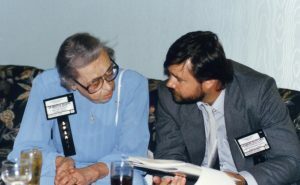 Nursing Theory Congress in Toronto, 1988. Martha and I led a 4 hour workshop on the application of the Science of Unitary Human Being to practice and research. 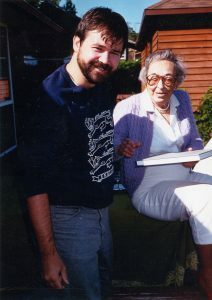 Me giving Martha a copy of my Masters Thesis in 1986. 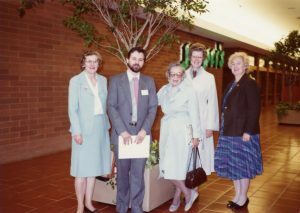 Nursing Theory Conference in Edmonton, Canada, 1982, when I first met Martha Rogers. 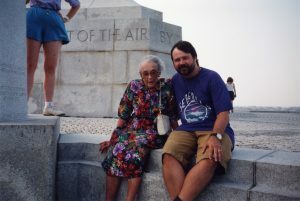 Sculpture of Martha E. Rogers, Photo taken by Howard Butcher at the unveiling. Martha E. Rogers' Nursing Science Copyright © 2018 by Howard Butcher. All Rights Reserved.